We'll, darn it all, @IowaDee I had never heard of igourmet until you mentioned it. I am extremely likely to be spending time on that site and perhaps even drop a buck or two. Thanks for the bierocks dough recipe. I'm smoking a sirloin tip roast today, and may make some sort of made-up-and-baked sandwiches from that next week. Shelby, I hope you'll show us the rest of the enchilada-making process as well as the finished results. I still have some peeled and roasted Hatch chiles, and some tomatos. How would I get from there to enchiladas? Fabulous blog so far, and you have nothing to worry about in the interesting and entertaining department. I think many of us are quite engaged in your tales. I am assuming that by steaming the Hatches in the CSO you mean the steam BROIL function to get the browning. I don't think I would be the only one interested in how you did that. I'm sending good wishes for luck on tomorrow's fishing expedition and looking forward to your report. Just make sure to remind them not to lose Chum as you send them off with breakfast. I put the peppers on and steam broil them at 500F for about 7 minutes on each side. Yes, how is Chum? Is she helping out with things? As the cats are, I assume? I love reading your blogs - or your posts in general. You have a knack for description and always make us feel warm and welcome! I also love how you draw on so many things - your own garden, local fishing and hunting, online resources(!) and bring them together to make such interesting meals. Chum is in hog heaven. She adores going with the guys. I cease to exist even more in her world during these stints. Thank you for the compliments--I really need to branch out and do some different type meals for deer season but it's hard not to make my tried and true meals that I know (usually) turn out decent. So, I usually make breakfast sandwiches every evening for the guys to heat up in the morning and eat or take with them. They don't care to eat anything sweet --they are savory guys. I decided to mix it up and make some breakfast burritos. I saved one for me and I'm eating it right now....maybe I'm just hungry but they are reallllly good. The meat is venison breakfast sausage that we make. 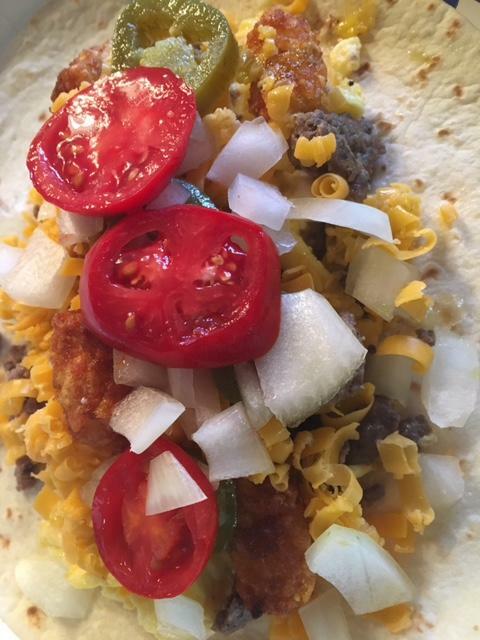 Those are tater tots under the tortillas (no, I didn't make the tortillas...sigh...I am lazy). The jar is my pickled jalapeños. Don't skip using them...they add the perfect spice to the burrito. Homemade sauce (everything from the garden) and venison meatballs (the ones that have the zucchini in them that I posted about on the zucchini thread). I don't care what it tastes like, I just like the label lol. Lazy? I couldn't think of a word any further from the truth to describe you. for the Good Eats !
" How's that choke ? " HAHAHAHHA we bought that wine for the exact same reason!!! I bought a bottle of 19 Criminals hard chard and a bottle of their red blend at TJ's today. Haven't tried it yet but was drawn By the labels. Am loving your blog. Thank you so much for sharing everything. I love 19 Crimes. Did you check the cork to see what your crime was? You are making me want spaghetti and meatballs. Next week, maybe. and I don't care for oak. The luck just seems to be gone around here. The guys went frog hunting --they found a zillion of them, but they were sneaky suckers and they couldn't manage to land any. So, they went fishing at the river. Caught one fish. So our grand total so far is three doves and one fish . They have gone to the lake today so maybe the fish total will rise a bit. Saturday night is always "game night"--which means I cook what ever they've managed to bring home........we might get into fist fights over the doves . If they don't catch any more fish, I'll supplement with some wonderful shrimp that I got from Pike's Place Fish Market last week. I'm also hoping that I have some catfish from the river frozen down in the basement freezer....however, if you don't hear from me again it means that when I opened that door an avalanche of frozen foods fell on me and I cannot dig myself out. Dinner last night started yesterday afternoon when I plucked the pork roast out of the Instant Pot. I poured this into the food processor--managing to make a huge mess because I should have done it in two batches. Instead I got to mop the floor. Here it is all whizzed up. 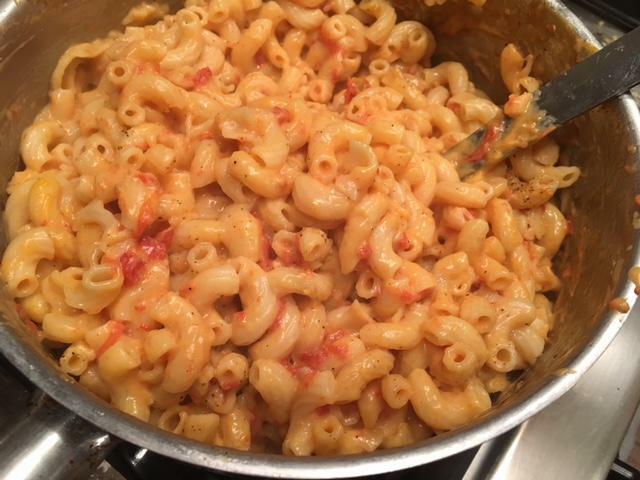 Sometimes it's not quite thick enough so I have to cook it down a bit, but this time it was perfect. I took half of the roast (froze the other half) and shredded it. Then I added several dollops of sour cream. Bake at 350F for about 30 minutes and it's bubbly. I love that you bought some. Tell us what your cork says! @Shelby YOU are one super-organized hunting guru!!!! Deer season will hit here soon enough, and I can already guess the best I will muster up to feed the crowd will be jelly donuts and apple fritters from Econofoods. And coffee. Must have coffee. @ChocoMom -- I have had success canning chili before when i didn't have room for all the ground venison. SEVEN deer? Unless y'all have REAL small deer, that's a BUNCH of venison! I'd have to be making some summer sausage, too. @kayb he he....no, we have full-sized deer here. White tail, and some Piebolds. Because of our farm, we are sent applications for additional deer permits from the DNR. This year, we ended up with 7. Yes, its a lot of venison, but we freeze it, can it, make sausage, and give it away to friends and relatives. This gives a list of my meatball ingredients --just omit the zucchini and up the bread/milk mixture a bit. My meatballs are like my meatloaf....they never come out the same way twice. Wish I lived closer. Been a long time since I had a regular venison supplier. @rotuts is a much more hardened criminal than I am. I sent bierocks along with the guys for lunch today. They just got home and were unloading the boat and placed an uneaten bierock on a table in the garage. Roxy has now had a really great dinner. The fishing trip yesterday yielded one keeper catfish so that brings our grand total to two fish and and three doves . But, before we get to dinner we have to talk about this appetizer I made yesterday afternoon. On the IP thread @Anna N made a savory cheesecake a while back and I've been meaning to make something similar for a long time. 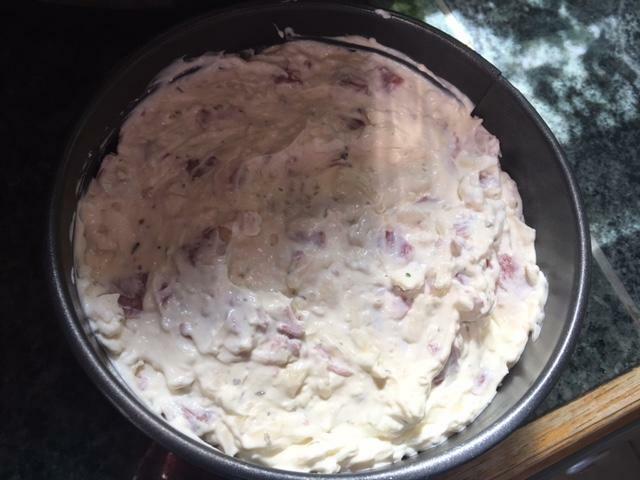 I ran across this recipe for Muffuletta Cheesecake and being that I love muffulettas, I decided to see if I could make it work in the Instant Pot. I halved all of the ingredients, I used one egg and instead of provolone, I used mozzarella cheese. A picture of the ingredients --minus the cream cheese because it suspiciously snuck out and was hiding on the stove. I like to wash as few dishes as possible, so when I made the crust, I melted the butter in a ziplock and then added the crackers right to that. Just make sure you get it zipped shut all the way....I've had to wash butter out of the microwave a few times. Sigh. I put a piece of parchment paper in the bottom of the springform pan and then mushed the cracker/butter mixture in. I decided not make the crust go up the sides of the pan because the condensation from the IP would make it soggy. Here it is right before spending 20 mins. at high pressure in the IP. And here it is after. Doesn't look much different lol. There was a bit of condensation on the top so I gently used a paper towel to soak it up. The recipe says to let it rest in the fridge overnight--I only chilled it for about three hours due to not reading that far ahead. But, it was just fine. Seriously, this was so fun and easy to make and it is EXCELLENT. I didn't make my own olive topping--I use Boscoli Olive Salad Mix which I think you can get at most grocery stores. I toasted a bunch of bread in the CSO to go with it. A few weeks ago I had wanted fried shrimp and was sure I had Panko crumbs. Well, I didn't so I decided to sub crushed Rice Chex. I like using the cereal better than Panko now. Anyway, as I said above, I had some wonderful shrimp so we had that along with the two fish and three doves. Frying with the Rice Chex is more steps than a beer batter--don't get me wrong, I still love beer batter, but sometimes you want more of a crunch, you know? I seasoned some flour with Lawry's Salt and black pepper, I beat three eggs in a separate bowl and then I crunched up the cereal in a ziplock. So you dip your shrimp and fish in the flour, then the egg and then the Rice Chex and fry it up. And, I had two bags of fresh spinach in the fridge that needed to be used, so I threw them in the IP with lemon pepper, salt and butter. Perfect. And, that's it for this trip He will be back at the very end of November for deer season. Hopefully it proves to be more successful than this time--however, since there were no birds, our wonderful hunter friend helped us remove our zillion pound big screen tv that didn't work anymore and installed a new, much lighter one so I'm not complaining No game=chores done for Shelby. See you back here in a couple months and as always, thanks for hanging out with me!